Freediving UAELatest NewsFacts about Freediving and its amazing records! Facts about Freediving and its amazing records! Since Dahab is one of the world´s main spots for freediving, almost every day I see freedivers around here practicing their skills (if I actually just look to my right now, I can see three different floating devices around 30-40m offshore). I am totally astonished by their abilities of holding their breath, relaxing to a point where the heart beat slows down to less then ten beats per minute and controlling their mind. I watched dozens of videos and just cannot be anything else than fascinated. Freediving or Apnea (the Greek word a-pnoia literally means “without breathing”) is based on a subconsciousness reflex (mammalian diving reflex): As soon as cold water encloses our face, the body shifts its bloodstream from the extremities into the brain and heart and slows the heart beat down. The body does so attempting to keep the most vital functions alive and concentrates the flow of oxygen into the heart & brain. This effect has been studied in dolphins, seals and other mammals. The deeper the dive, the stronger it gets. After years of training freedivers are able to calm themselves down using various breathing techniques and achieving a state of general fitness. So freediving is a lot about relaxation and very mental, as one has to learn to deal with the urge to breath to extend the dive. The history dates back several thousand years. Humans are believed to have been freediving a long time in search for sponges, fish & shells making freediving most probably one the most ancient sports of them all. A great myth tells the story of a sponge diver recovering an anchor of a Italian ship in front of an island in Greece. In 1913 the ship lost its anchor and asked one of the best spongedivers in this area to recover it. This guy was named Chatzistathis or Haggi Statti, was about 1,70m in heights and weighed around 65kg. The legend says he recovered the anchor from 88m depth, holding his breath for about three minutes. He used a primitive technique, Greeks have been using as long as their civilization exists: the so called “Skandalopetra”. A round stone with holes for the fingers, almost used like a steering wheal of a car enabling the driver (or diver) to change directions while diving down headfirst (!). According to the story, he was rewarded a little amount of money and the permission to fish with explosives. Usually this discipline is practiced in a pool and aims to hold the breath as long as possible. The current world record recognized by AIDA lies at 11min and 35s, hold by Stéphan Mifsud since 08.06.2009. This discipline is about deepdiving. It is not allowed though to drop any weights during the dive and fins (either mono or bi) can be used. The current world record (AIDA) lies at 128m achieved by Alexey Molchanow on the 19.09.2013. Basically the same like above just without any use of fins. The current AIDA world record holder William Trubridge achieved an incredible depth of 101m on the 16.12.2010. In this discipline divers use a vertical guiderope to pull themselves down and up again without dropping weights during the dive. Again William Trubridge holds the current world record (AIDA) with 121m since the 04.10.2011. Divers use a weighted sled to descend and ascend by using fins or pulling themselves up a line. William Trubridge holds the world record (AIDA) of this discipline as well with 145m. He achieved this depth on the 03.09.2013. This discipline allows all kind of equipment to dive as deep as possible. Usually a weighted sled is used to descend and an inflatable device to ascend again. Herbert Nitsch holds the world record (AIDA) with an incredible 214m since the 14.06.2007. 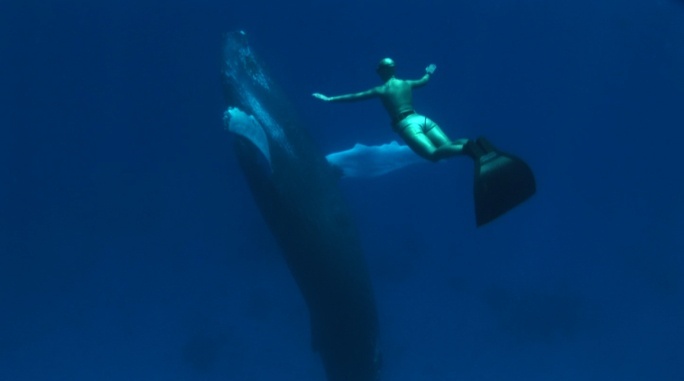 One doesn´t have to aim that high in order to practice freediving and enjoy it. There a various freedive centers offering training from beginners to more advanced freedivers. The ones I´ve looked into either offer a training by SSI or by AIDA . By being able to hold your breath for as long as possible and equalizing properly to achieve greater depths, people will encounter completely new experiences of diving. Fish and other marine inhabitants are not as disturbed from noise of bubbles and breathing, allowing you to get a much closer look than they most probably would have granted you while scuba diving. Therefore, underwater photographers might want to improve their freediving 😉 Just the other day I had a nice encounter myself: I was practicing a bit and saw some squids below me in around 7 m depths or so. I slowly pulled myself down the rope and gently swam towards then. They are usually very shy but let me get quite close before they opened the line formation only a bit (I don´t know why, but I´ve usually seen them like this) and let me swim through them – Awesome! People have been freediving and spearfishing for a long time and still today there are many people practicing it (though I do not support this, as I rather see all kinds of fish swimming than on a plate..). I just started recently with some easy exercises here in front of Bannerfish bay and I really love it and hope to be able to do a course soon or at least before I leave beautiful Dahab.. My girlfriend and me had a day with freedive Instructor Brian Crossland almost two months ago now, but this course was rather targeted at improving the breathing in general for scuba diving in order to achieve longer dive times. Nevertheless we gained some very interesting knowledge which I try to apply now. If consciousness is lost, drowning may appear. Therefore it is very important, that you always dive and train with a buddy. If you dive without a buddy, no matter how deep, and a shallow water blackout occurs, you are likely do drown. By now there are thousands of active freedivers around the world, and every year a number of them dies. There are no statistics about this, but most likely a couple of dozens loose their lives while freediving. Another potential dangers is the squeeze of your eardrums and finally their explosion. The deeper you go, the higher the water pressure gets pushing your eardrums in. There are several equalization techniques, but if you don´t know how to to them, it can get very painful and worst case scenario is that you can lost your ability to hear or suffer from ear problems for the rest of your life. Obviously this danger increases the deeper you go. Beginners are not likely to encounter severe problems (if they don´t push it without proper training). 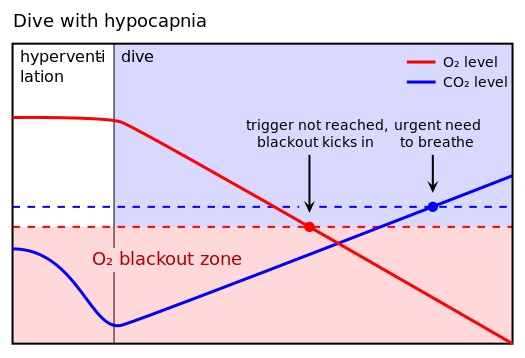 There are many other dangers concerning freediving, especially the competitive deep diving. If you are interested in knowing more about these, I´d recommend some more reading on this.